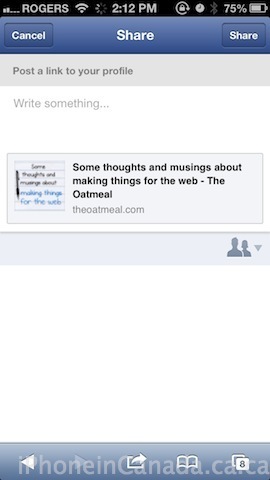 Facebook has released the much anticipated ‘share’ button for its mobile news feed (m.facebook.com) and TechCrunch notes it will soon be coming to the iOS app as well. Previously, the ability to share a story was limited to the full web version of Facebook, but that has now changed. 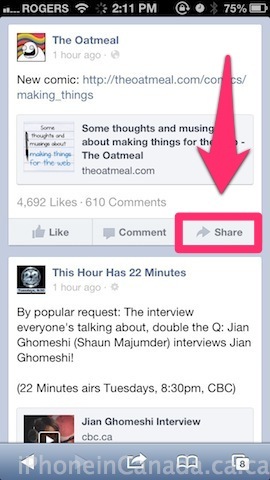 Facebook has just confirmed with me that it is launching a retweet-style “Share” button for the mobile news feed. The much-requested feature is now rolled out for the mobile site, and will soon come to the iOS and Android apps. This was by far one of the most anticipated features mobile users have requested. This addition will only help stories, images, and videos related to cats and such go viral even faster. Let us know if you are liking this update.